Health Savings Accounts (HSAs) offer significant tax advantages and can be an effective way to cover health care costs in retirement. By law, HSAs are available to individuals who enroll in a qualified high deductible health plan (HDHP), are not enrolled in Medicare or covered by another health plan, and who are not claimed as a dependent on someone else’s federal tax return. On the surface, a qualified high deductible health plan offered by an employer may appear intimidating to an employee because of the high deductibles. To qualify as an HDHP, in 2018 the minimum annual deductible and other out-of-pocket expenses for self-only coverage range from $1,350 to $6,650. Family coverage is even higher with a minimum annual deductible of $2,700 and a maximum of $13,300. While premiums are generally lower than traditional insurance plans, individuals are responsible for paying their medical costs (at the insurer’s negotiated rate) until they have met the deductible and the insurance kicks in. Ideally, the individual has enough saved in the HSA to cover these expenses. HSA contributions are either tax–deductible or pre–tax (if made by payroll deduction), grow tax-deferred, and withdrawals used for qualified medical expenses are always tax-free. Qualified medical expenses include medical and dental expenses that generally would qualify for the IRS medical and dental expenses deduction, including prescription drugs and long-term care insurance premiums. Once the individual turns 65, the funds can be used for any reason without penalty, although income taxes will be owed on funds that are not used for qualified medical expenses. Unlike a Flexible Spending Account (FSA), the funds in a HSA roll over from year to year without limit and the individual owns the account. In 2018, an individual may contribute up to $3,450 (or $6,850 for a family) to the HSA. Tax-free contributions can be made as long as the person participates in a high deductible plan. In addition, the individual can choose to invest HSA funds and earnings in the account are not taxed. The HSA is portable. 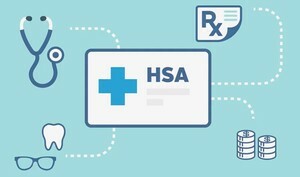 Even if the HSA was established by an employer, the individual can keep the HSA upon termination or retirement, regardless of whether contributions were made by the employer or employee. In conjunction with savings in a 401(k), savings in a HSA can be an excellent resource to cover health care costs in retirement. According to Fidelity, the average couple retiring in 2018 can expect to pay $280,000 or more for health care during their retirement years, and this amount does not include long-term care. The tax-free spending on health care allowed by a HSA can be a boon for retirees, and a key tool in retirement planning for employees of all ages.